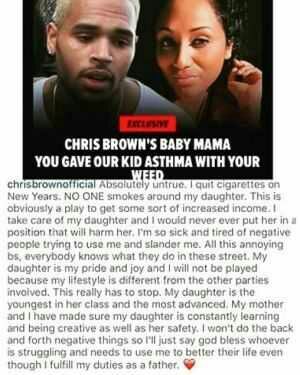 Did Breezy’s addiction to cigarettes give his baby girl asthma?? Yesterday, we reported Nia Guzman was taking the singer back to courtwith claims that Chris’ smoking habit is affecting the health of their one-year-old baby girl. 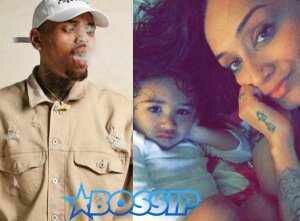 Nia Guzman claims 1-year-old Royalty has developed asthma, and she says it’s all because Chris has exposed her to an extremeamount of secondhand smoke. Brown is a weed and tobacco enthusiast.Nia says when Royalty comes back from a visit with Chris she usually reeks of smoke. Nia wants to restrict Chris’ visitation … asking the judge to force him to hire a full-time nanny or pull back on his right to be aroundthe child. And Nia wants more child support … she’s getting $2,500 a monthbut wants it upped to nearly $16k a month. Chris Brown took to his Instagram page to refute the rumors and claims that Nia is only trying to get more money from him:Do you think Nia is just trying to protect their daughter or just in it for the money? ?